I grew up at 7641 S. Shore Dr, 1946-1964. There are remains of this pier visible as pilings on Google Earth just to the north of the existing breakwater at the base of 75th street. There are the remains of additional piers between 75th and 72d street. They appear to be about the same today as they were in the 1950s and ’60s. My father (1902-1988) used to tell me about riding the trolley cars down 75th St. to go to the amusement piers. That would probably have been in the 19 teens. Also, between 74th St. and 73d Streets there is an apartment building which was constructed in the late ’50s which extends out into Lake Michigan. This was legally possible because there were platted streets and lots in the area which were eroded away in a large storm in 1917. The developers bought the lots which were now underwater and were able to build out into the water. 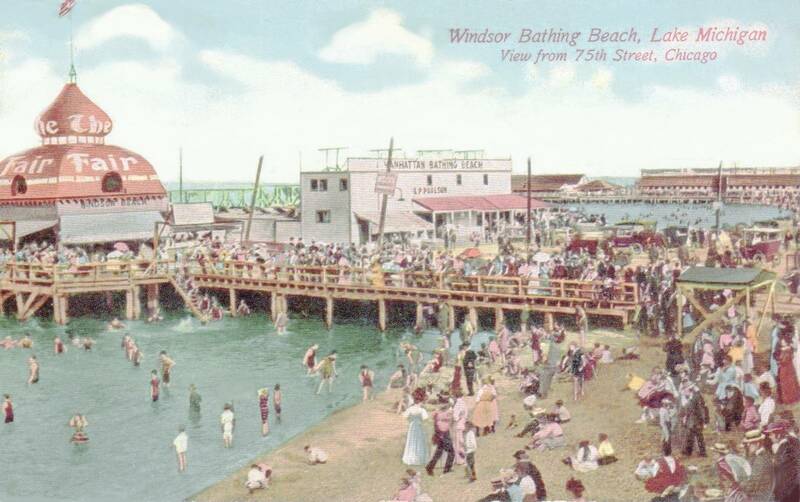 The present Rainbow Beach was constructed in the 1940s when the city used dredges to pump sand onto the shore from deeper water. I believe the breakwaters were probably built about then or a bit earlier. I do not have a personal memory of this but my mother told me about seeing it. My parents moved into the 7641 apartment building in 1943. As I look at the limestone block break waters it appears that they have settled since the 1950s and ’60s. I do recall the breakwater at the south end of Rainbow Beach, near the filtration plant, being extended about 1958 or so. There is a bend in the break water. The older portion of the structure is from that bend to the shore.